Fall in love with diamonds and the beautiful pink hue of rose gold with Apples of Gold Jewelry's 14K rose gold 0.25 carat diamond heart necklace! The soft pinkish color of the gold pairs well with the delicate heart shaped pendant, which measures approximately 1/2 inch in size, and is covered with sixteen diamonds to add extra sparkle to this beautiful necklace. The diamonds are rated H+ for color and I1 for clarity, and altogether have a total carat weight of 0.25 carats. 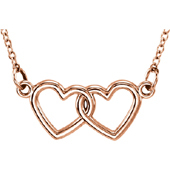 We guarantee our 14K Rose Gold 0.25 Carat Diamond Heart Necklace to be high quality, authentic jewelry, as described above.